I got back last night from a four day trip to California for a job interview. While I was gone Greg walked A.J. on some of the trails. Everything was covered in deep snow, which A.J. likes to occasionally pounce into. On at least one occasion during this time he came up out of the snow covered in burrs and cheatgrass. On the way home from the airport Greg told me he “practically did an autopsy” making sure he got all the burrs and cheatgrass out of A.J.’s fur, he was sure he got all of it out. Collection of burrs A.J. brought home from a single walk. When I got home, I knelt down to pet A.J. and immediately got stabbed by a burr. 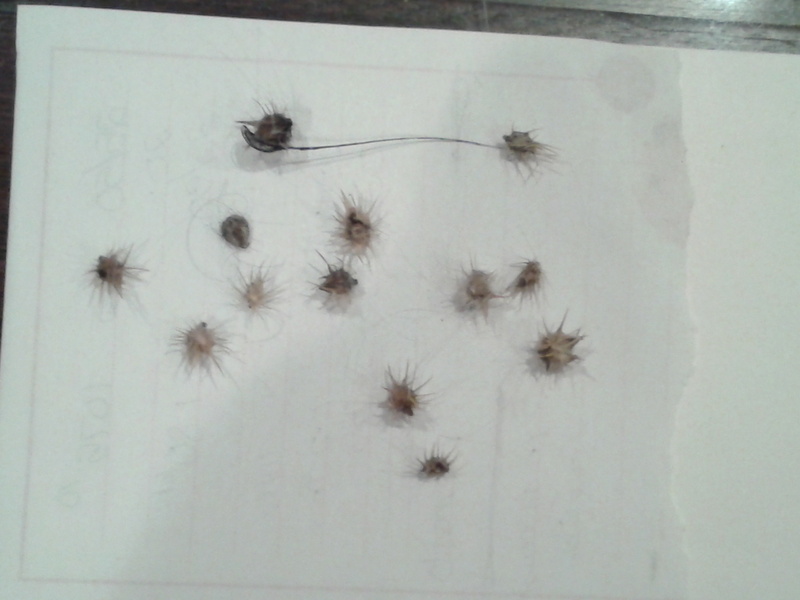 I wound up finding several burrs buried in the fur of A.J.’s legs, paws, and ears. And I stepped on one more later. Ouch! But the good thing was that the two of them had a perfectly fine time at home without me. Greg spoiled A.J. with chicken casserole, he put him in the tub when he needed ice balls melted off his feet and belly, and he took him for two very long walks every day. They’re really getting along pretty well these days. The first night I was gone Greg got into bed and A.J. walked over to my side. He stood there and looked at Greg, then looked at where I was supposed to be, then he looked at Greg, then looked back at my spot, then back at Greg. I interpreted that as “Where is she? She’s supposed to be here. Go get her.” Greg interpreted it as “Hey, she’s not using that spot, can I have it?” We’ll never know who was right. My first night home last night at bedtime I gave A.J. his treat in his crate as per our usual routine. Normally he comes out of his crate and lays down on his bed. Last night he went to his bed, stopped, and looked over at me. I said “Yes, I’m here now.” He laid down and went to sleep.